Here, Oregon reviewer Erin Brooks reminisces about all of the great wines and experiences she's had this year. I was impressed with the quality of the wines from 00, a new project founded in 2015 by Chris and Kathryn Hermann. Bunker Hill is 00’s first single vineyard Chardonnay. Made using Burgundian techniques and with a fair amount of skin contact to extract phenolics, the result is a creamy textured but ethereal style of Chardonnay, light-footed, savory and minerally. Rose & Arrow is a new project from Mark Tarlov (a founder of Evening Land) with Louis Michel Liger-Belair of Burgundy and terroir specialist Pedro Parra of Chile. Using electric conductivity mapping, the team is exploring the soils of Willamette in search of sites worthy of grand cru status. The Point is one of the project’s “first expression” bottlings—Tarlov says they haven’t discovered grand cru soils yet, but this site comes close. The wine is dense and layered with red and black fruits, exotic spices and floral notes while buzzing with electric energy. Sequitur is a new project from Mike Etzel of Beaux Fréres and his partner Carey Critchlow, who planted their Sequitur vineyard just next to Beaux Fréres’ Upper Terrace vineyard. The 2016 Pinot Noir is earthy and savory with ripe fruit—classic and everything I hope for in a great Pinot from Ribbon Ridge. The 2016 vintage has turned out consistently high quality wines in Oregon, with values to be found across producers, styles and varieties. But for the greatest values, Chardonnay is a standout. The quality of Chardonnay in Willamette has risen precipitously, but so far prices haven’t followed that trend. How long before producers—and wine buyers—wise up? Jim Maresh says 2016 was a truly great vintage, and his wines certainly show it. The 2016 Dundee Hills Chardonnay is delicate, elegant and so, so minerally. Much of the fruit comes from very old, dry-farmed, own-rooted vines planted by the family in the 1970s—the wine is less than $30 but only 100 cases were made. 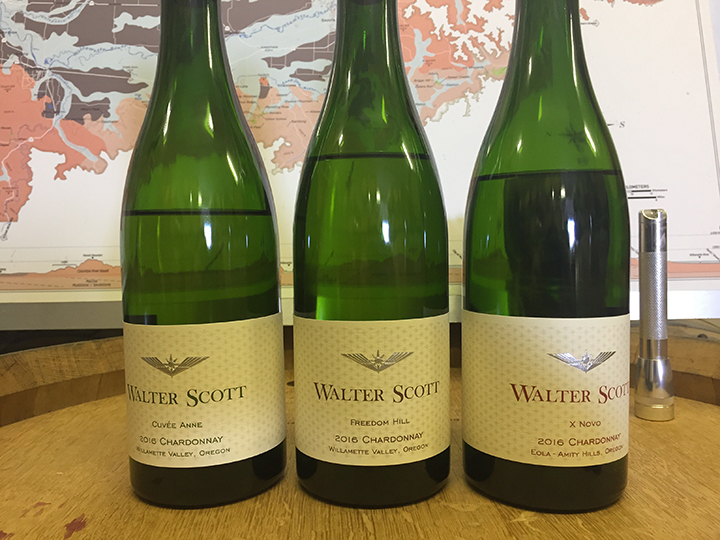 Jason Lett crafts compelling wines in the Dundee Hills from old vines planted by his father in 1965. The 2016 Estate Chardonnay comes from very old vines in the original Eyrie Vineyard and offers the most beautiful floral perfume and citrus nuances with a deliciously creamy texture. World-class winemaking at less than $30 a bottle. The 2016 Estate Pinot Noir (92 points) is just as good and only $38. This is one of the most compelling Chardonnays I tasted during my trip to Oregon to review the 2016 vintage. It’s a study in opposites: creamy textured but tangy, delicate but with layers of savory/umami, fresh but mouth-filling. “I believe Oregon is the best place for cool-climate Chardonnay outside of Burgundy,” winemaker Ken Pahlow says, and I agree. As the score reflects, this is world-class wine for a paltry price tag of $65. A trip to Burgundy with The Wine Advocate team was a vinous adventure of epic proportions. We tasted from barrel and bottle in the underground vaulted cellar of Domaine Dugat-Py, originally part of an abbey built in 1219 now known as the Cellier des Dimes. Loïc Dugat-Py poured a 1985 Charmes-Chambertin from one of the family’s personal, unlabeled bottles hidden away in the back of the cellar, and it was one of those speechless wine moments: you’d have to be a skilled poet to turn liquid like that into words. I’m a huge fan of Sherry and 2018 was full of great old bottles. At our Matter of Taste event this year in New York City, I had the privilege to taste the 100-point Solera 1905 Pérez Barquero Amontillado and was again rendered speechless. I’ve never tasted anything quite like it: texturally rich and concentrated but full of salty tang, with oxidative aromas of roasted nuts interlaced with scents of iodine and smoke—reminiscent in some ways of great peaty Scotch. I’m still dreaming about it. I was lucky enough this year to drink lots and lots of Krug Champagne—several editions of the Grande Cuvée and vintage bottlings. My sommelier friends and I also discovered that Krug with a splash of Chartreuse V.E.P. is a match made in heaven (or sacrilege, some might say). But nothing can top the experience of sipping Krug in the house’s cellars in Reims, daydreaming about a few bottles from the 19th century still lining a shelf, a rare privilege on a rainy day in July. The honors for 2018’s best dinner goes to The Wine Advocate’s 40th Anniversary Matter of Taste BYOB dinner in New York City. With Robert Parker in attendance, the room was packed with supporters, subscribers and friends all with hand-picked bottles from their personal cellars in tow. The 3-liter bottle of 1989 Aldo Conterno Barolo from Parker was divine, but I couldn’t stop there. I had to get tastes of the magnum of 2009 Dom Pérignon, the 2002 Cristal Rosé, 1967 Château Latour, 1968 Louis M. Martini “Mountain Barbera” crafted by Philip Togni, 1978 Château Clos de Sarpe, 2005 Château Mouton-Rothschild, 1978 Gaja Sori’ San Lorenzo Barbaresco, 2004 Giuseppe Quintarelli Alzero Cabernet Franc from the Veneto and the 1970 Produttori del Barbaresco. But what was truly special about the evening was the incredible group of wine lovers, from collectors to winemakers to importers, enjoying and discussing these beautiful rare wines together. On a trip to Chablis this year I visited Domaine Laroche. Grégory Viennois, technical director for the estate, graciously spent several hours driving me around the vineyards of Chablis, through the grand crus, premier crus and outlying areas, to walk in the vineyards and talk about what makes the region special. Afterwards, I had the pleasure of tasting through the entire lineup of the Domaine’s just-bottled 2017s. Nothing drives home the notion of terroir like tasting the wines from the different vineyards you’ve just walked through. 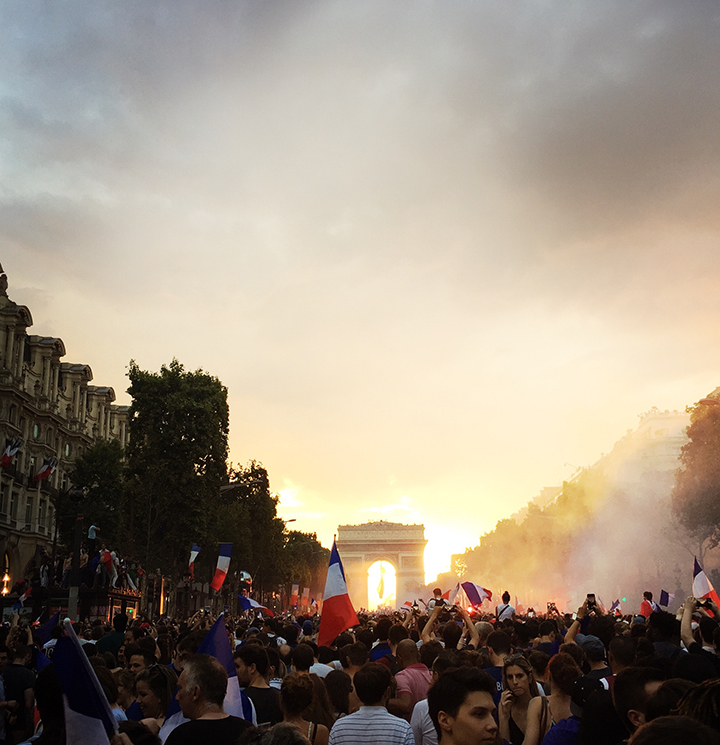 I’m no sports fan—tell me your team and I’ll ask you what sport it is—but arriving in Paris in time for the World Cup Final was a once-in-a-lifetime experience. Bastille Day celebrations took place the night before; I ate homemade pizza and drank beer out of plastic cups sitting on the side of the River Seine while watching fireworks at the Eiffel Tower. The next day the city was in chaos before the final game of the World Cup—the streets were packed to the gills with French flag-wearing crowds. After the win, I found myself swept along the Champs-Élysées toward the Arc de Triomphe with what the news later estimated were a million people in the streets of Paris, chanting “Allez les Bleus, allez les Bleus!” while drinking local wine from a water bottle. People stood on top of moving cars, scaled bus stops and lampposts and shot fireworks into the pink evening sky as the sun set. There’s nothing quite like the sheer energy of the joy, excitement and pride of a million Parisians after a World Cup win.